The AltusGroup partnership of architectural and structural precast producers has become the exclusive U.S. and Canadian sourcepoint distributor of Graphic Concrete technology for imparting durable patterns and images onto precast surfaces such as facades, walls, spandrels and soundwalls. Graphic Concrete Ltd. offers a namesake process enabling durable patterns and images to be produced on precast concrete surfaces. The technology was invented in the 1990s by interior architect Samuli Naamanka, who envisioned an industrial product for large-scale surfaces and a tool with which architects could be more visually creative. Graphic Concrete is a patented technology that has been used extensively in projects across Europe, the Nordics and Australia. It transfers custom or stock patterns as a surface retarder via membrane placed at the bottom of the form. Concrete is cast atop the membrane. After a panel or product is cured and extracted from the form, the retarder is washed away with a high-pressure washer, revealing an image that results from the contrast between the fair faced and the exposed aggregate surface. Selection of various aggregates and pigments can dramatically expand possibilities in the finished surface. The agreement with Graphic Concrete builds on the AltusGroup’s expanding portfolio of precast innovations. 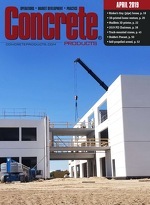 Producer members will use the Graphic Concrete technology on CarbonCast Enclosure Systems, the group’s mainstay precast concrete high performance sandwich walls and architectural insulated cladding products, plus Arcis Rainscreen thin section panels and other precast elements that can take advantage of the image technology.